Sharon Long is here to review Melissa Ginsburg, www.melissaginsburg.net, debut novel, Sunset City. Melissa is the author of a poetry collection as well as a chapbook. This novel was published by Harper Collins and released in April. Before the drugs, Danielle Reeves was Charlotte Ford’s most loyal and vibrant friend. She helped Charlotte through her mother’s illness and death and opened up about her own troubled family. The two friends were inseparable, reveling in Houston’s shadowy corners. But then Danielle’s addiction got the best of her and she went to prison for four years. When she gets out, she and Charlotte reconnect. Charlotte hopes this is a new start for their friendship. 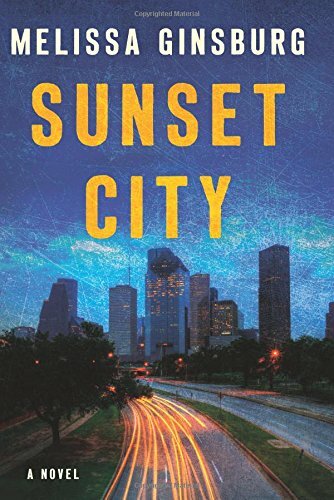 The author has taken what noir crime writers found in Los Angeles and brought it to Houston. Her writing is easy and almost lyric at times even though the subject matter is sad. I enjoyed the relationship between the Detective and Charlotte. She reminded me of a desperate young woman trying to find her way in a grim world. Sunset City is sad, funny, hopeless and hopeful all in one story. I was surprised but satisfied with the ending. Melissa is currently working on a new literary thriller.